You can be who you are without diminishing or changing the other person. Roy Lee “Simon” Jarmon was diagnosed with Post-traumatic Stress Disorder (PTSD) in 2004. To express how he felt then, Jarmon was asked by his attending psychologist to write a letter to his injured comrade as a therapeutic exercise. He realized that writing is his calling from God. With writing, it made his journey easier as he was recovering from PTSD. 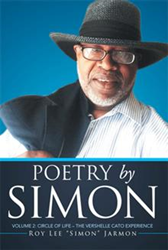 In “Poetry by Simon Volume 2: Circle of Life – The VERSHELLE CATO Experience” (published by Xlibris), Jarmon shares a collection of his poems, prose and other creative pieces. Here, the reader is the main character; he or she may identify and place himself or herself in the experiences shared by the author. It is a deep, soulful look into life experiences and with how one deals with those experiences, whether positive or negative, as well as one’s thoughts and feelings with regards to those situations. For all its wide and all-encompassing scope, Jarmon writes in an easy-to-read format, opting to speak directly to one’s heart rather than wax philosophical about life’s mysteries. “You can be who you are without diminishing or changing the other person,” says Jarmon. He hopes that the down-to-earth approach to life that he has taken in his book would help people understand and appreciate one another as persons.